There are plenty of children and adults who plan to pig out on Halloween candy this year, but the Food and Drug Administration (FDA) is warning that eating too much black licorice could lead to serious health problems. The U.S. agency issued a warning earlier this week saying that eating more than two ounces (roughly the equivalent of four tablespoons) of black licorice per day for at least two weeks could lead to an irregular heart rhythm in consumers over the age of 40. Experts have connected health problems with black licorice to glycyrrhizin, a sweetening compound found in the licorice root. The substance has been shown to lower potassium levels in the body, which could lead to arrhythmia, high blood pressure, edema, lethargy, and congestive heart failure. FDA expert Dr. Linda Katz says that the agency received one report of health problems last year related to black licorice consumption, but she says that there are generally no permanent health problems as long as consumers limit their consumption. 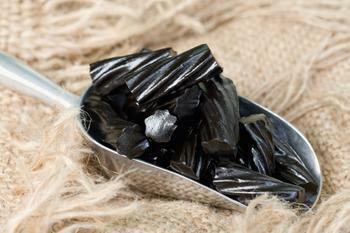 Black licorice can interact with some medications, herbs and dietary supplements. Consult a healthcare professional if you have questions about possible interactions with a drug or supplement you take. Consumers are urged to contact the FDA consumer complaint coordinator in their area if they experience any problems related to licorice consumption.